This week, between July 16-22, the UK will be hosting Farnborough International 2018, an arms fair with a particular focus on aircraft. The event will bring some of the world’s biggest arms companies together with a number of government and military delegations that have been accused of serious human rights abuses. The list of the military delegations invited to attend has not been published yet, but among those invited to attend the event in 2016 were military reps Bahrain, Egypt, Oman, Philippines, Qatar, Saudi Arabia and Turkey. 1500 companies will be displaying at Farnborough, including many of the world’s biggest arms companies. The weapons on display will include missile systems, fighter jets and drones. 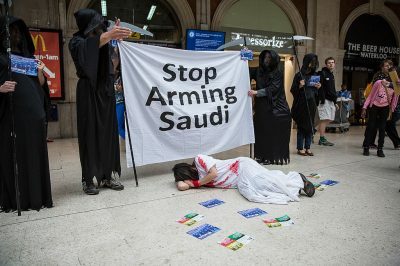 The companies in attendance include BAE Systems, MBDA and Raytheon, which make the combat aircraft and bombs that are being used by Saudi forces in Yemen. Military delegations are invited by the Department of International Trade’s Defence & Security Organisation, the civil service trade body that exists to promote arms exports. “We don’t know how the arms being promoted at Farnborough might be used in the future, or who they will be used against. Right now, Saudi Arabian forces are using UK fighter jets and bombs in their brutal bombardment of Yemen. The arms sales being negotiated this week could be used to enable atrocities for years to come.